Over the last two months, the two biggest groups in European Parliament — the centre-right European People's Party (EPP) and centre-left Socialists and Democrats (S&D) — have seen an upward trend, according to Europe Elects, though they are still projected to take major hits in the May elections. Europe Elects, which provides poll aggregation and election analysis, said the two main factors for their recent, though mild, recovery is Brexit uncertainty and a reduced interest in immigration. "People see what's happening with Brexit, so many voters are stepping away from populist parties because of the uncertainty," said Tobias Schminke, founder of Europe Elects, to Euronews. "The immigration topic is also becoming less important, so right-wing parties have fewer issues to mobilise with." Despite some recovery by the EPP and S&D group in recent months, both are projected to take big hits in the May election when compared to the 2014 results, with the centre-right group forecast to lose 37 seats while S&D are predicted to drop 56 seats, according to data from Europe Elects. ALDE has also been gaining voter support because of recent national events and politics, particularly in France and Romania, according to Schminke. En Marche — which is predicted to join the liberals ALDE group and is included as such in this projection data — is slowly recovering in approval ratings following President Emmanuel Macron's listening tour after months of yellow-vest protests, while in Romania voters are turning to ALDE as the ruling Social Democrats party is plagued by corruption allegations. The liberal group is projected to gain 39 seats should En Marche proceed with ALDE. The flow chart below illustrates how projected votes have evolved since the 2014 European Elections. 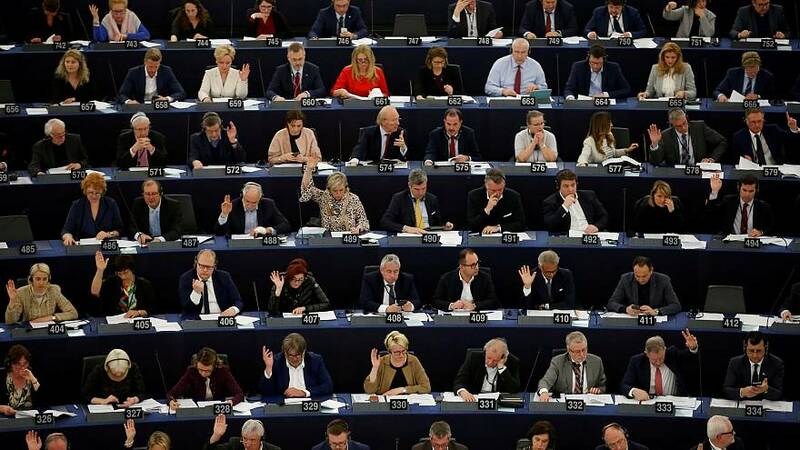 The data in the European Parliament projection is collected by Europe Elects and is based on publicly available opinion polls about voting intentions and election results in countries of the EU27 (member states of the European Union without the United Kingdom). In cases where no European election opinion poll is available, opinion polls for national elections were used. In cases where no opinion pollings on voting intentions were published since the last national election, the election result is used. For more information on the methodology, please visit Europe Elects.